​Let's take a minute to recall the format of our design unit. In each design lesson, you are introduced to a new profession that uses technology and the design process to solve a problem, make a product, or provide a service. We begin the lesson by learning about the profession. Then, we participate in a live action role play, where you have to perform the job using technology and the design process. Finally, we evaluate what we have learned. So, let's get started. ​What Is a Structural Engineer? So, what is a structural engineer anyway? Let's watch the video below to find out. A structural engineer is a person that designs structures like bridges, buildings, domes, tunnels, and dams. These things are part of our national infrastructure. Infrastructure is everything that a region or country needs to function properly. Infrastructure covers a lot of different things like buildings, bridges, roads, schools, cell phone towers, internet access, water treatment plants, and power stations. 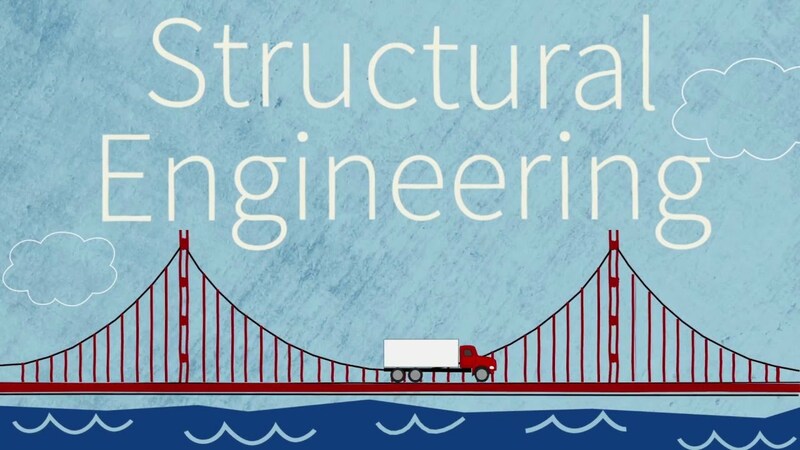 ​What did you learn from the video about structural engineers? Turn to your shoulder partner and tell them one thing that you learned. Be ready to share what your partner told you. The town of Craggy Rock is a coastal town that has grown very quickly over a short period of time. Many of the new homes and businesses are built around the river and bay. With limited roads and bridges, the traffic has become just terrible. It takes almost an hour to get to work or school and those who ride bikes are run off the road because there are no bike paths. 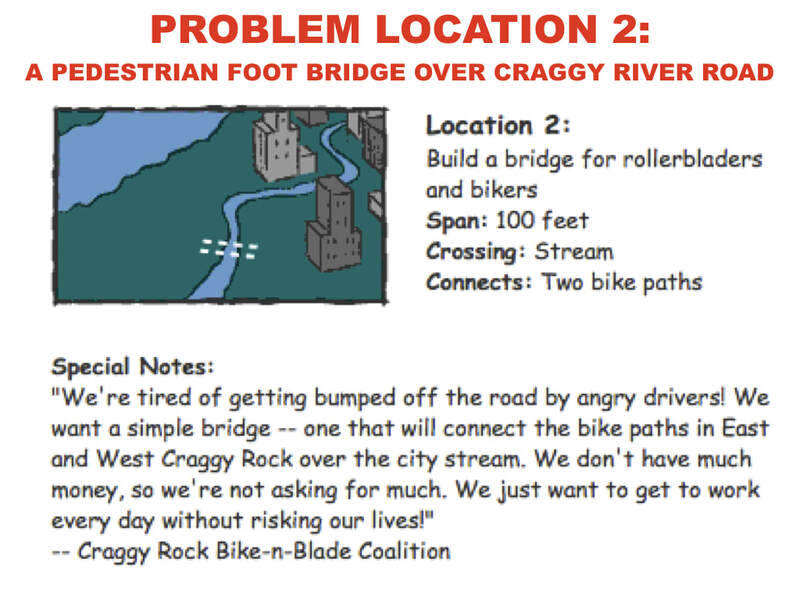 Craggy Rock is asking your firm to help them solve their traffic problems. 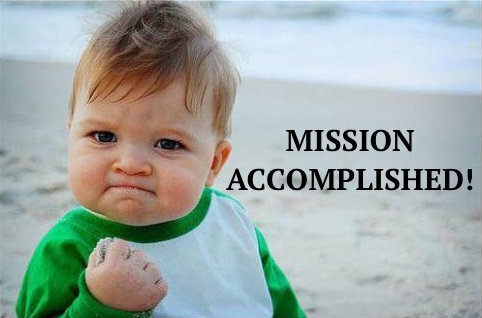 Your mission, should you chose to accept it, is to pass all five design challenges and meet your mission objective. 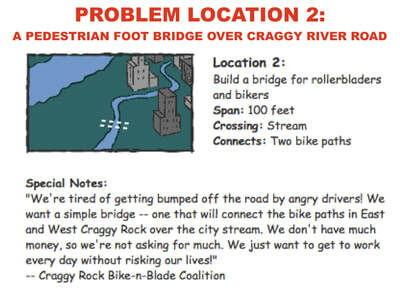 I can use the design process to solve Craggy Rock's traffic problems. ​Who Are You Trying to Help and What Are They Experiencing? 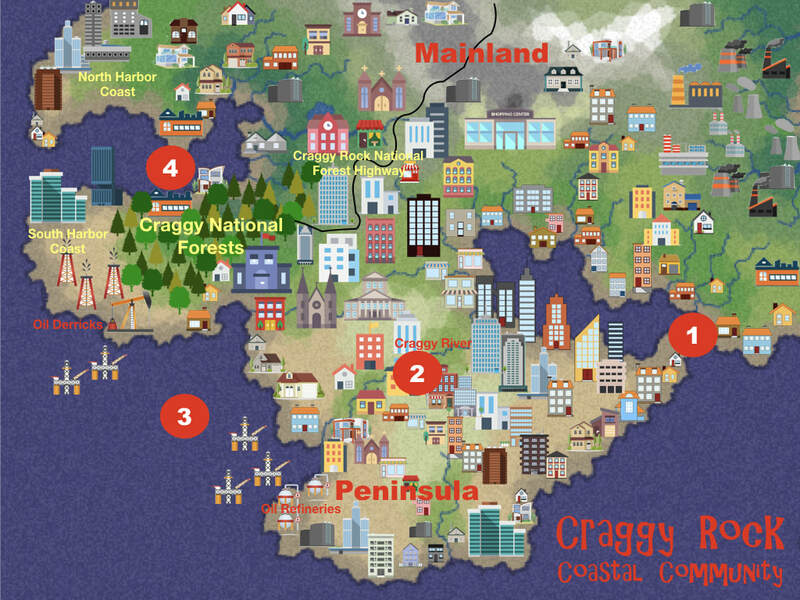 Below are maps of Craggy Rock. 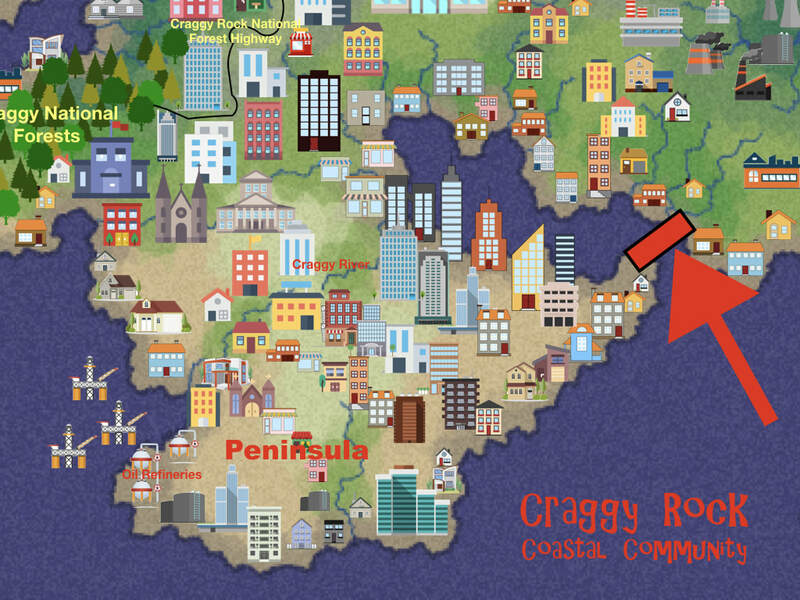 Craggy Rock is a thriving coastal community. The citizens of Craggy Rock are very active in their town. Many people jog, bike, and walk their dogs on the coasts and near the rivers and creeks. Hikers enjoy exploring the forest trails. Families enjoy the parks and community activities. It seems like everyone is always out, no matter what time of day. People work, go to school, shop, do business, run errands, and have fun. 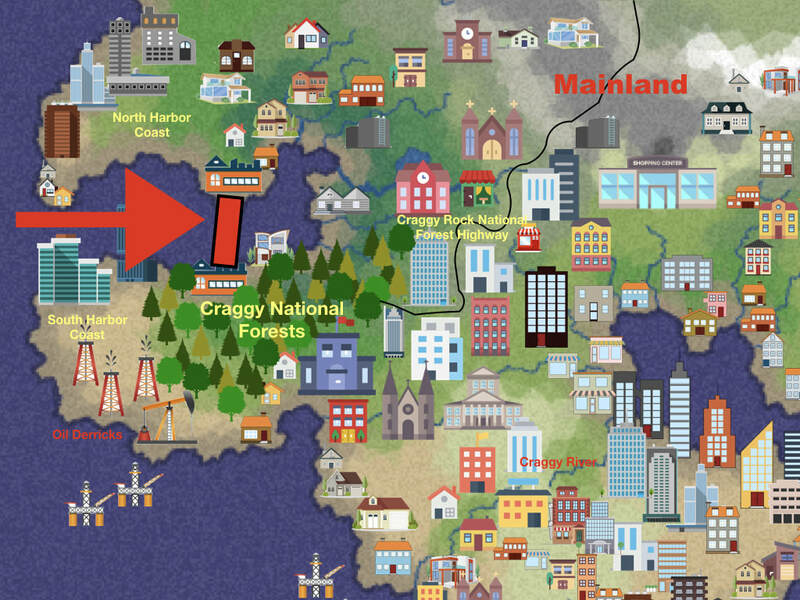 In this first activity, we will learn about the people of Craggy Rock and the things they experience within their town. Follow along as we go through a tour of the town! Craggy Rock has become a very popular place for young families to live. In fact, the town has grown so quickly that traffic and safety have become a major concern! There are four major areas that are causing problems. 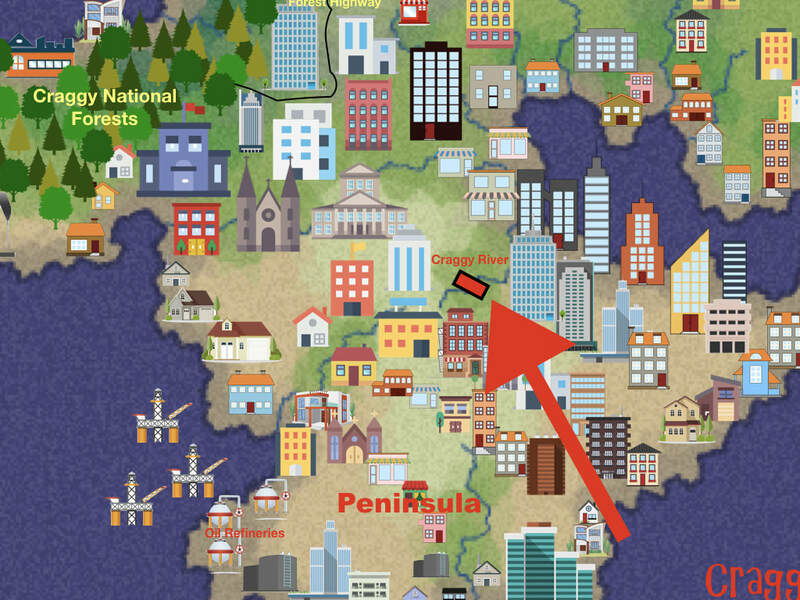 The first location that is a problem is the peninsula. A peninsula is a piece of land surrounded by water on three sides. In Craggy Rock, a river separates the peninsula from the mainland. 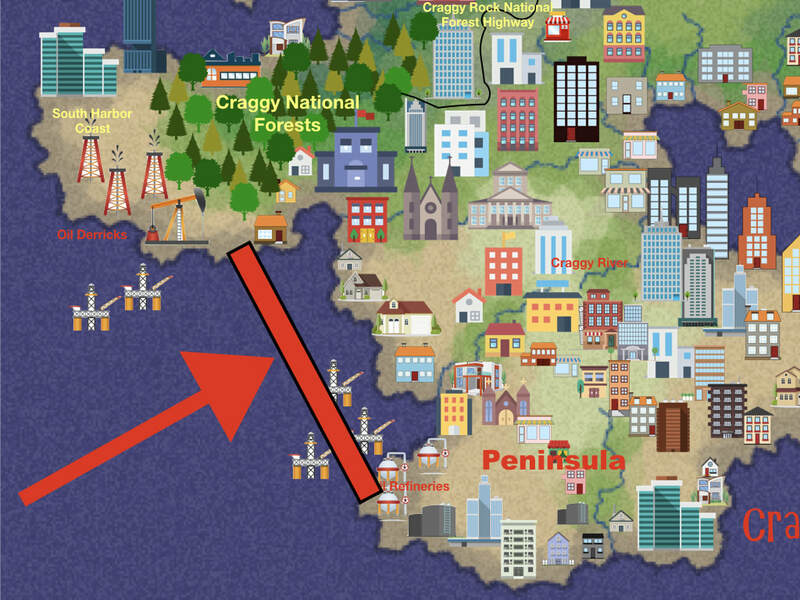 Currently, to get to the peninsula from the mainland, a person has to travel all the way up to were the mainland meets the peninsula and then travel down the coastline of the peninsula. The backed up traffic can turn this 20 minute drive into a ninety minute drive! YIKES! The second location that is a problem is Craggy River Road. Craggy River Road is a road that runs along the Craggy River on the peninsula. The road is a major road that leads in and out of the peninsula. It is also a very scenic route where pedestrians like to jog, walk their dogs, rollerblade, and skateboard. Pedestrians are people who travel on foot, especially those in a town or city. The problem is that there is so much traffic on the road that is has become dangerous for pedestrians to walk on the business district side of the road and there is no way for them to cross the river so that they can safely use the other side of the river walk. The third problem location is the Southwestern Craggy Harbor Coastline. 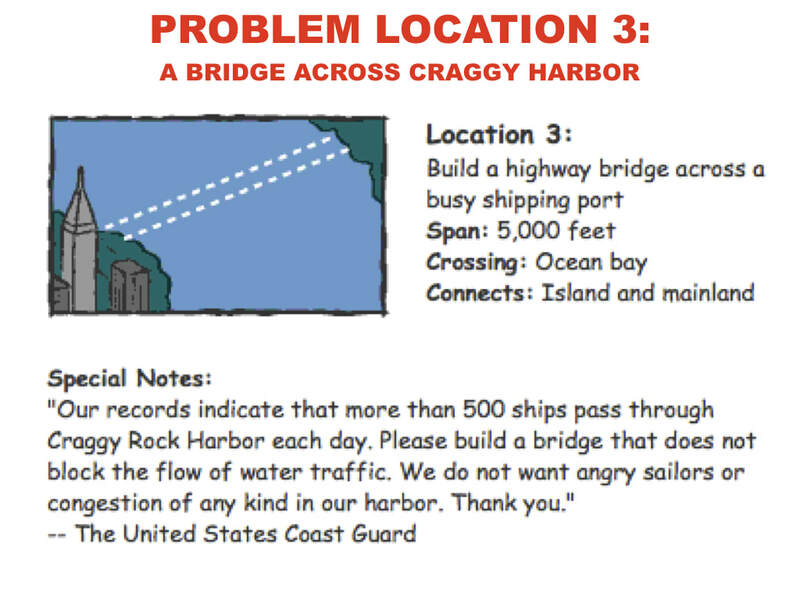 Craggy Harbor has become a major port where boats ship people and products in and out of Craggy Rock. Traffic around the Southern to Peninsula coastlines has become very congested as more and more shipping companies and homes have been built on the coastline. One business that is really important to the Craggy Rock economy is the oil business. The word, economy, refers to the ways in which an area uses its resources and how it makes and spends its money. Craggy Rock has oil derricks on the North Coastline and oil refineries on the South Coastline. An oil refinery is a place that cleans the oil so that it can be used. The traffic makes it difficult for oil trucks to get the oil from the derricks on the North Coast to the refinery on the South Coast. The Craggy Rock National Park has become a popular destination for citizens to spend their leisure time hiking, camping, kayaking, fishing, and picnicking. Leisure time is the free time you have to do something that you enjoy. It has also become a popular tourist destination. People from all over come in cars, planes, boats, and trains to vacation. The problem is that most people drive down through the Craggy Rock Mainland by Craggy Rock National Park Road to get to the park. The road has become very congested with traffic from the mainland to the Harbor Business District. 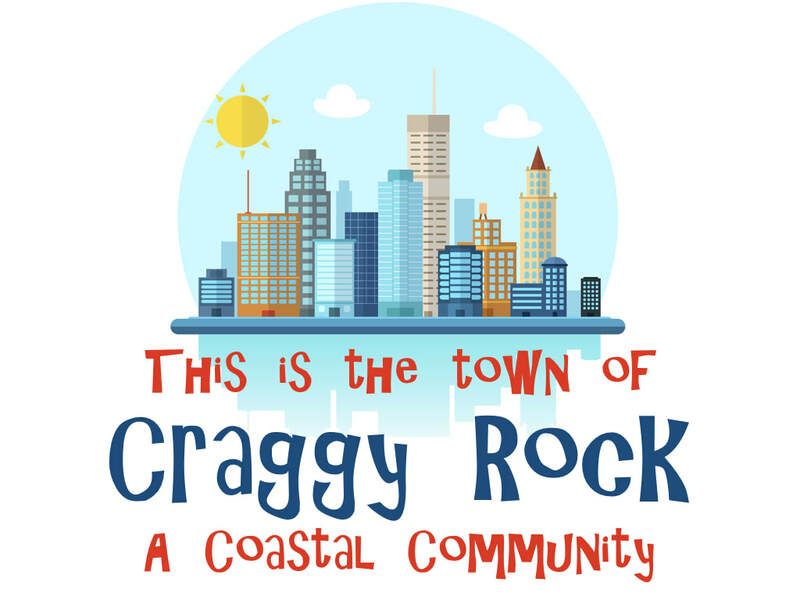 So who are the people of Craggy Rock and what are they experiencing? Click on the link below to answer the questions about Craggy Rock. Reply to three other students comments on whether you agree, disagree and why. WHAT PROBLEMS IS CRAGGY ROCK EXPERIENCING AND WHY? In the Define Challenge, you will identify exactly what problems is Craggy Rock Experiencing and why they are experiencing them. Below you will see each problem area in Craggy Rock again. With your shoulder partner, answer the questions on the gathering evidence survey for each problem area. When every team has finished, we will discuss the answers as a class. IN WHAT WAYS COULD YOU SOLVE CRAGGY ROCK'S PROBLEMS? In the Ideate Challenge, you will brainstorm and research solutions to Craggy Rock's problems. 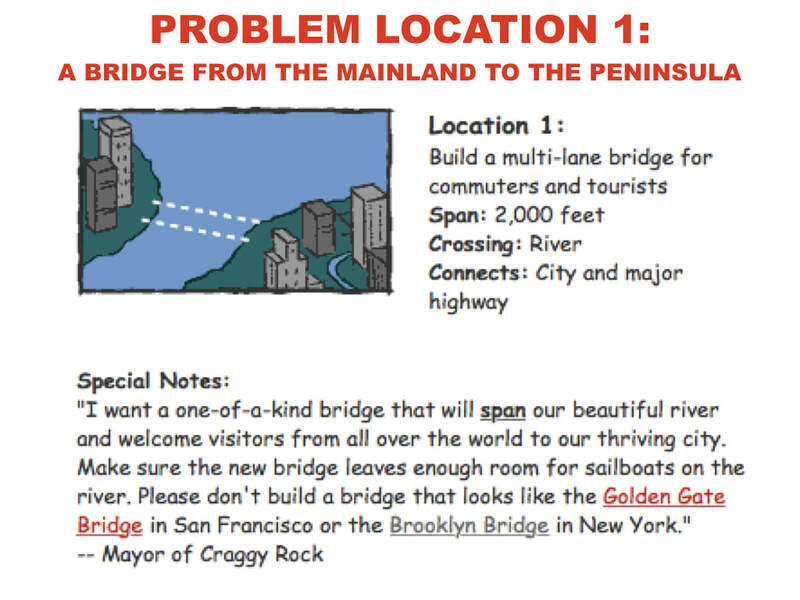 In this activity, you will research the different types of bridges and learn how bridges are built to solve community problems. Click on the icon below to learn about the different types of bridges. Use the Bridge Organizer below the icons to organize your research information. 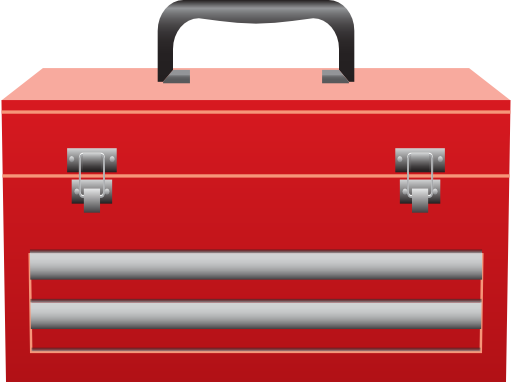 If you finish before other groups, click on the Labs icons to explore the building materials labs. Click here to research bridges. Click here to participate in the labs after you do your research. WHAT WILL YOUR SOLUTION LOOK LIKE AND WHAT IS YOUR REASONING? 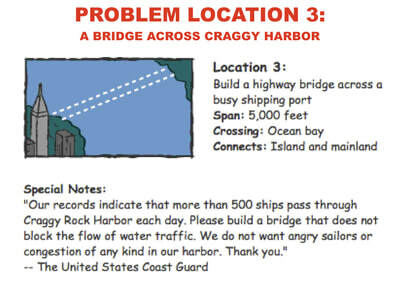 You have determined that bridges are needed to solve the traffic and safety problems in Craggy Rock. You have researched different types of bridges to get a better understanding of how certain types of bridges are built for different types of environments and situations. 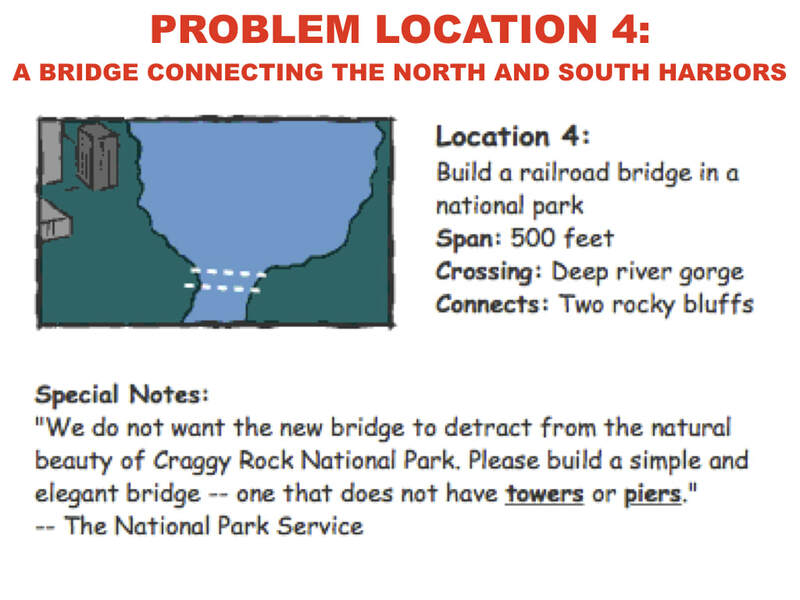 Now, you are ready to design the four bridges that Craggy Rock needs. You are now ready to design the four bridges that Craggy Rock needs, but before you start, the citizens have some requests for each bridge. Look at the requests for each bridge. Using what you know about the environment and the community's requests, choose a bridge design for each location that best meets the needs of the community. Under the Locations section, you will see the requirements for each location. 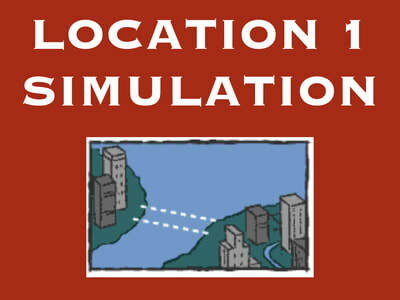 You can click on each location image to enlarge it. Under the Bridge Designs and Types Section, you can see images of the different Bridge Designs and Types. Finally, under the Justify the Design Section, you will complete the online assignment by answering the questions to justify why you chose the design and types you chose. Scroll below this to see the different designs and types of bridges. Below are the different bridge designs and types. To go to the Online worksheet, scroll below this section. 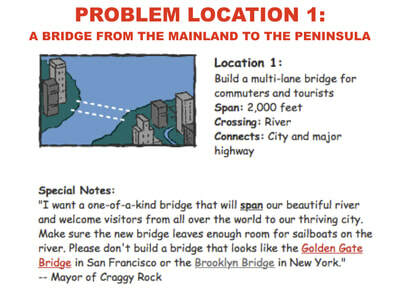 Answer the following questions to select your bridge design and types for each location. Now you need to test your design. 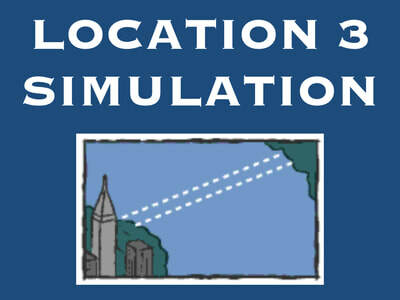 To do this, you will participate in an online simulation and record the results. 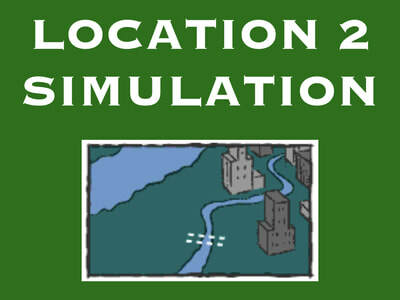 Click on the icons below to participate in each online simulation. Record your results on the Test It Activity below the icons. 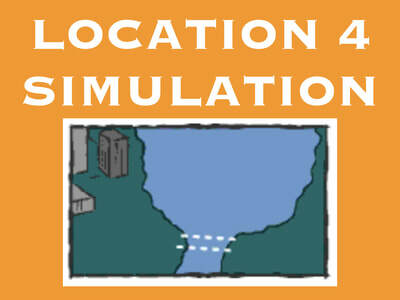 Click on the link below to answer the questions about the simulations. What is one thing you learned in this lesson? Click on the link below to share it in our blog. Then, respond to three other students' threads. Click here to participate in the Reflection Blog for this lesson. Congratulations! 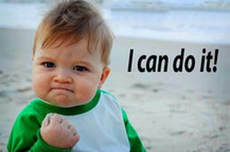 You did it! You accomplished your mission! You used the design process and the knowledge you learned about structural engineering to solve the traffic problems in Craggy Rock!